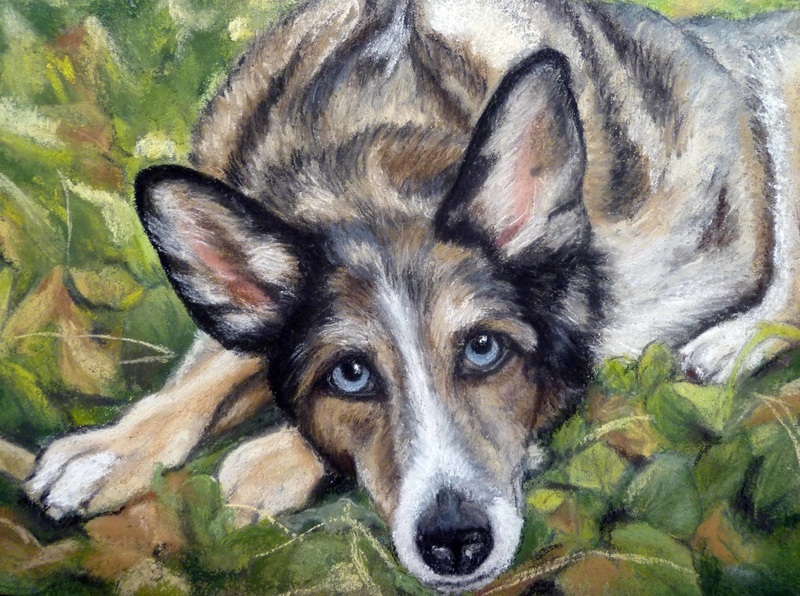 I can't thank you enough for the magnificent portrait of my dog Corky,. I've seen your work at shows, so I knew you are talented. Still, the portrait far exceeds my expectations, and I'm very particular! It's amazing how you captured Corky's personality, especially "that look" of his I saw hundreds of times during his life. When I see his blue eyes looking at me from your portrait, it is as if he is right in the room with me. What really struck me the most, though, was your ability to paint his very unusual coat to a "tee." Corky had the merle gene and therefore had a dappled or speckled coat of several colors and that was tipped with black. You are very, very talented to have painted his coat so realistically that I want to reach out and pet it. 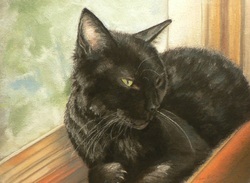 Although Corky has been gone for several years, looking at your portrait of him makes me feel as if he is with me in my house again and that is very comforting. You are truly a gifted artist. Note: Judy received a free portrait of Corky after winning the drawing for a mini portrait at my December 2014 open house. 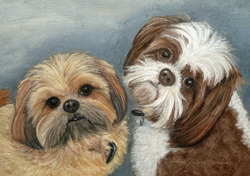 ...Everyone I've shown the portrait to loves it and comments on how you captured their personalities! I've given your name out to several people. Thanks for everything, Dana you do beautiful work and the end result is it makes a lot of people very happy. You don't know me but you did a portrait of my dog for my birthday. My sister Dorothy ***** had ordered it from you and they gave it to me about 10 days ago. I haven't had the opportunity before now but I wanted to let you know how much I loved it. It looks exactly like he did when he was young. He is old and crippled and I don't think I will have him much longer and that painting had a profound impact on me. I absolutely love it and can't thank you enough, I am saving the note cards for special occasions, they are so beautiful. Thank you, Dana, you have a wonderful talent of not only capturing the physical but the essence of him as well. Have a wonderful holiday. for everything and please don’t hesitate to pass my name on to anyone who might find it helpful.